Baili and Matt first met online, like several couples do nowadays, on Match.com in September 2015. They talked for awhile and eventually in October, they went on their first day to Gervasi Wineyard in Canton, Ohio. The first time that Matt told her that he loved he was when he broke his back and she stayed by his side all night in the hospital. They went on their first big vacation together: Disneyworld in Orlando, Florida. They were staying at Animal Kingdom Lodge. The day they got there Matt REALLY wanted to go take a pictures outside with some of the scenery. They were waiting for their luggage to arrive at the resort (and she didn't notice that Matt had brought his tripod onto his carryon.) It was about four in the afternoon and they hadn't eaten since they began our traveling experience and Baili was really hungry but Matt wanted to go take pictures. As soon as Matt set up the tripod outside it began to storm. They took the tripod inside and every time it stopped raining Matt would rush back out to set up the tripod again. They did this process about four times as the rain stopped and started again. Baili was starting to become HANGRY and trying her best to be patient because she assumed Matt was just VERY excited and wanted to take pictures. After about the fifth time of carrying the tripod in and outside she finally said "Babe, can we please go get food I promise we can take pictures later." Matt nervously said "Ummmm yea, okay ...." but she could tell he looked EXTREMELY disappointed. She took a deep breath and said "It's okay let's try it one more time." As they were outside it began to rain once again and she said to Matt "Honey, can you please PROPOSE a new idea?" and he said "Well, it's funny you said that..." and in the rain he got down on one knee. She was very surprised but then understood why he had insisted on getting pictures right at that moment. Matt was just so excited to propose he couldn't wait and had to do it as soon as they got to the resort. They were married a little over a year from their first date on October 14th, 2017. The day started off with the bride and the bridesmaids getting ready at her grandma's house in North Canton, OH, where we took the girls getting ready photos and Baili's family formals. From there, we headed to the ceremony location at Church of the Lakes in Canton, OH, where we started off taking the groom and the groomsmen's photos before the ceremony. After the ceremony, we snapped a few more family formals before heading to Perry Sippo Park in Canton, Ohio. After taking the bridal party photos, as well as photos of the bride and groom, we headed to Perry Heights Party Center, where everyone danced the night away. This photo features the bride twirling her dress around. 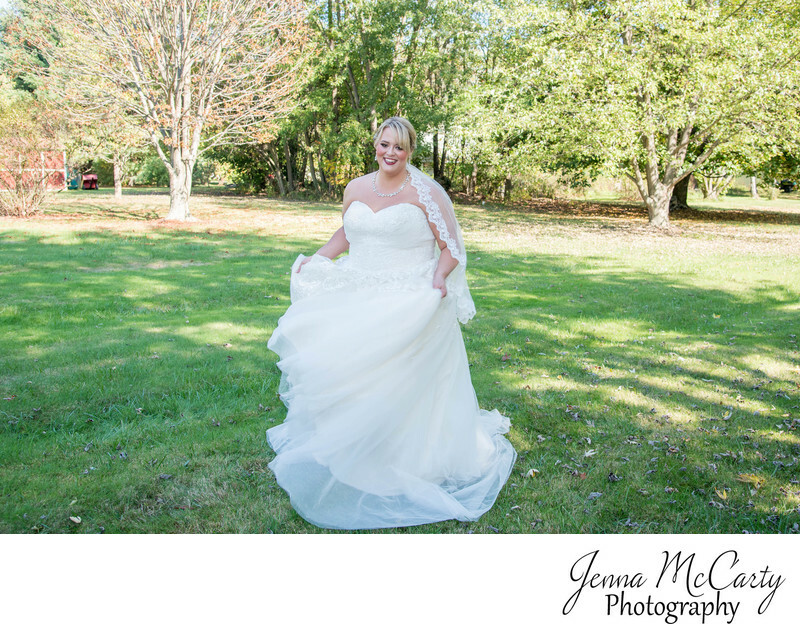 It was a hot October day in Ohio, so the bride was overheating in her bridal gown, so I suggested twirling the dress around to get some air moving. She loved the idea and it definitely helped.